The spatial pattern of 20 year sea surface height trends from satellite altimetry is placed into the context of historical modes of wind-driven ocean volume redistribution identified in basin-scale, regional averages of tide gauge data. The difference between recent rates of sea level change in northern and southern regions is found to be twice as large and statistically greater than any other 20 year period during the twentieth century. 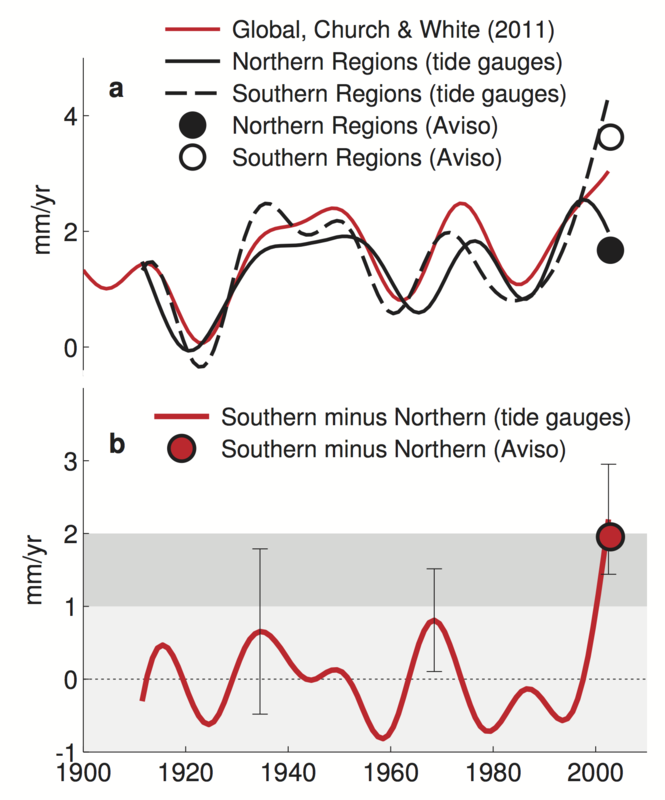 This unique asymmetry in the pattern of sea level change coincides with a departure from a historical mode of volume redistribution between southern regions related to a measure of asymmetry in the Southern Annular Mode. The asymmetry also coincides with a maximum in the rate of global mean sea level rise during recent decades, but the asymmetry is not apparent during an early twentieth century maximum in the global rate of similar magnitude. Figure. (a) Twenty year rates of change in mean sea level over northern and southern regions from tide gauges, Aviso, and Church and White . (b) The difference between mean rates over northern and southern regions from tide gauges and satellites. Uncertainties (1σ) are shown for the three largest differences in rate from tide gauges. Thompson, P. R., and M. A. Merrifield (2014), A unique asymmetry in the pattern of recent sea level change, Geophys. Res. Lett., 41, doi:10.1002/2014GL061263.